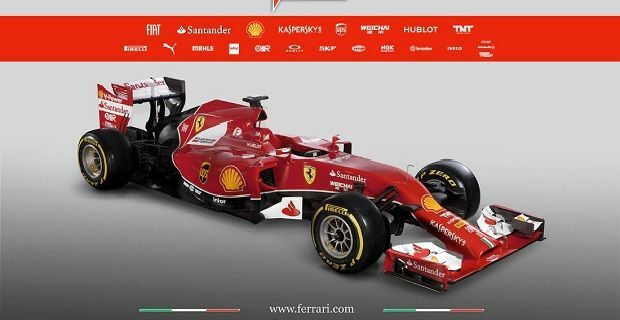 Ferrari have become the latest F1 outfit to showcase their new 2014 F1 car. The Ferrari F14-T is the Scuderia’s response to the most radical changes in the sport’s regulations for decades. The Italian team will be hoping that it will be on pace when the new season begins as they have started behind their competition in the last few seasons and played catch up. The Italian constructor will have found this year’s regulations especially challenging as the engine and chassis rules have changed dramatically. The new 1.6 litre turbo engines and the enforced aero changes will either mean that constructors like Ferrari and Mercedes have had to do too much development over the winter or their unique status within the paddock could mean better integration between the new engine and chassis. Ferrari have found that the chassis has been the weakness in the past few seasons, which is a consequence of the constructor’s windtunnel which seemed to miscalculate what the car will need on the racetrack last season. The windtunnel has now been recalibrated after the team took their cars to a facility owned by Toyota so we’re expecting their 2014 challenger to be more aerodynamically stable. Luca di Montezemolo has been pretty vocal about the team’s chances, saying that the arrival of Kimi Raikkonen to partner Fernando Alonso will give them everything they need to compete for their first World title since they won the 2008 Constructors’ World Championship.